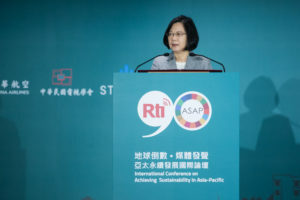 It had been a tricky task, balancing the need to make Radio Taiwan International’s (RTI) 90th anniversary celebrations suitably impressive with the organisation’s desire to ‘go green’. 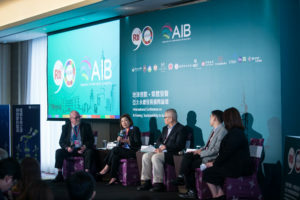 Indeed, the two-day event that the AIB had spent the last six months designing and curating was intended to be spectacular not in the traditional, aesthetic sense, but with respect to its ambitious theme: ‘Achieving Sustainability in Asia-Pacific’. 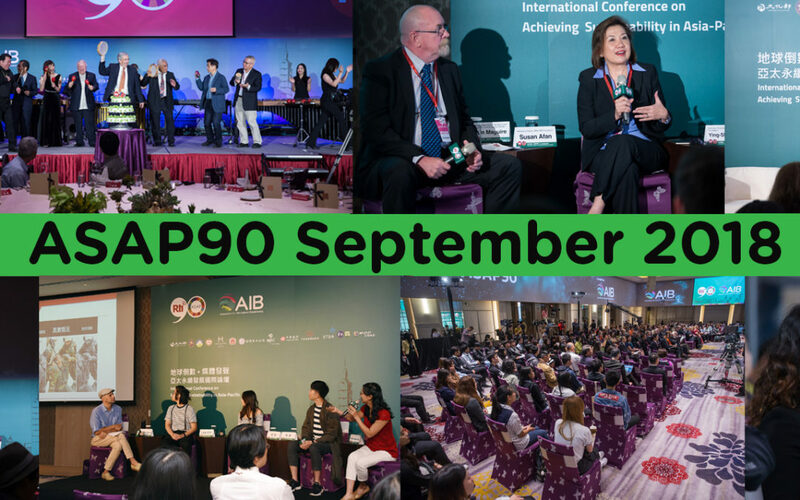 As such, a pithy acronym for social media mentions that reflected the urgency of the sustainability issues affecting the region was developed: #ASAP90. Throughout the event, speakers and participants from around the region gathered to discuss how sustainability can be both successful and equitable, the ethics of journalism and media in today’s world, and the degree to which journalism and activism are compatible. The first day’s conference opened with media representatives from around the world and members of the diplomatic corps standing as President Tsai Ing-wen reached the podium and opened the first day’s international media conference. The President spoke about the United Nations’ (UN) Sustainable Development Goals (SDGs), a set of 17 moral imperatives to which the UN’s member states agreed in 2015. She detailed how Taiwan is addressing the management of these issues through activities such as on-going reviewing of carbon emissions, as well as collaborating with civil society organisations, private corporations, academic institutions, and other governments to advance the SDGs globally. “Our conviction is simple: the planet belongs to everyone. Sustainability for Taiwan alone is not true sustainability, and sustainable development that excludes Taiwan is not real sustainability”. Significantly, the conference coincided with the UN General Assembly and an associated ‘Climate Week’ in New York. Following the opening speech, AFP’s short clips of citizens’ views on sustainability from around the region played as journalists and media representatives waited for the first session. 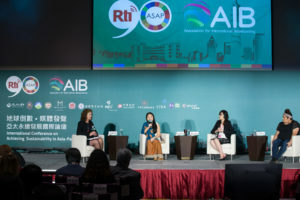 Entitled ‘Regional Issues, Global Impact’, the panel featured four women with substantial experience in the pressing and prolific sustainability-related issues in Asia-Pacific. Chaired by Radio New Zealand executive producer Philippa Tolley, speakers Claire Lin, Wang Yuni, and Larissa Baldwin explored how despite working in different countries and on different issues, all three primarily aim to address entrenched inequalities: Ms. Lin’s Nepal-based ‘Dharti Mata Sustainable Workshop’, which employs local women to manufacture affordable and eco-friendly sanitary pads, Ms. Wang’s work for renewable energy company WPD, and Ms. Baldwin’s environmental and social justice activism that promotes and protects the rights of Aboriginal and Torres Strait Islander people. It was clear that eliminating structural problems requires sensitivity to context, clear communication with perpetrators and those impacted, and a communal readiness for systemic change. Ms. Lin talked about navigating the complexities of native cultures in Nepal as an outsider and how it is incredibly important to be sensitive to diverse needs and traditions. Not doing so, for example by ignoring that women in certain communities are more likely to become involved in activities if they are approved by local male authorities, risks alienating those who need the most help and failing to create lasting change. As part of a minority and heavily marginalised series of nations within Australia, Ms. Baldwin was able to speak to the difference that this inclusion makes. Ms. Wang also recognised the role of outreach programmes and the importance of education and communication with local people in Taiwan in changing perceptions of sustainable solutions, which are often viewed with the same scepticism as the actions of companies that mine finite resources. The media is not exempt from complicity in the problem of misinformation. Ms. Baldwin said, “I don’t think that Aboriginal people are reading mainstream media”, which is likely due to a variety of factors. The small proportion of journalists that are able to obtain and retain a staff job is usually not reflective of the diversity of a given state, leaving minorities unrepresented in the industry. This often also results in a lack of communication about relevant issues which, when they are examined, are framed in a way that questions the everyday reality of marginalised people by including analysis from people who dispute their lived experiences and neglecting to include those who are worst affected in investigative research. This lack of engagement is also caused by inaccessible presentation of content, which could be overcome by disseminating the same information in a myriad of different ways, to ensure that the information reaches and “resonates” with non-traditional audiences. For example, Ms. Wang was speaking in Mandarin while the other speakers discussed the topics in English, but headsets that relayed live translation meant that the conversation could include such a variety of voices. In the media, this can be achieved by varying formats, from videos, articles, and podcasts, to careful consideration of choice of colour, tone, language, pace, and font. Without this diversity and inclusion, you cannot have national unity or claim to have a truly authentic free press. 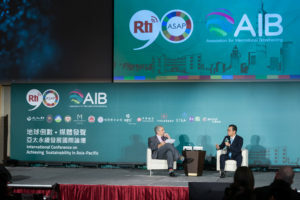 Following the first panel Taiwan’s Environmental Protection Minister, Dr. Lee Ying-Yuan, was in conversation with AIB CEO Simon Spanswick. 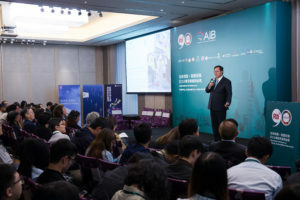 The minister discussed Taiwan’s commitment to a “circular economy”, which he described as previously only having three steps: “reduce, reuse, recycle”. Now, a pivotal fourth step is added: “redesign”. This is indicative of the Environmental Protection Agency’s dedication to inspiring individual lifestyle changes, but also to cause corporations to adapt their strategies and products to be more sustainable. Minister Lee stressed the importance of a multi-stakeholder attitude shift, adding that the government’s plan to cut 50% of its greenhouse gas emissions by 2050 and stimulating changes within the manufacturing industry would be irrelevant to combating air pollution when national and international customs involve “fire crackers and burning paper money” to celebrate significant moments. Key too, he said, was the media reporting with clarity, using statistics and facts, rather than sensationalising issues and causing public panic. 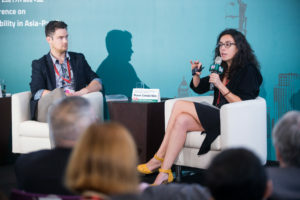 With this in mind, the second session of the day, ‘Making Media Sustainable’, reviewed the ways in which the media industry’s sustainability credentials could be improved on all counts. Chaired by the International Federation of Journalists (Asia-Pacific) Director of Program and Development, Jane Worthington, this panel featured Josh Griffin, the Diversity and Inclusion Lead for Australia’s Special Broadcasting Service (SBS), and Roser Canela-Mas, Sustainability Industry Manager for ‘albert’, an international collaborative project that originated in the UK that aims to increase the environmental sustainability of film and television productions. This session focused on changes created through altruism, and whether activist agendas are compatible with journalistic ethics. Mr. Griffin spoke about how “inspirational leaders” are a vital component of systemic change as they are relatable and aspirational, as well as being able to craft policies that instigate and support sustained improvement. This is relevant to all sectors and is a way to begin tackling institutional inequalities. Initially, however, this kind of progress can only be achieved if discrepancies between how perceptions of different demographics and the extent to which they have earned their successes are dismantled. Then, existing executives and shareholders must be willing to diverge from nepotistic hiring practices and recognise the need for diverse leadership. This goes against conventional incentives for elites but as Ms. Worthington so eloquently put it: “If decisions editorially are being made by just one half of the population then you’re only getting half the story, so actually if you’re changing and challenging the way things may have been done traditionally, you’re opening up the possibilities for fresh perspectives”. Similarly, Ms. Canela-Mas discussed the way that ‘albert’ unites competing companies, which demonstrates how powerful the threat of being seen as behind the curve is in a capitalist society. As an altruistic movement, ‘albert’ is manipulating the motivations of production teams and appealing to a desire to restrict expenditures. The project has kickstarted a series of decisions that prioritise environmental considerations, spurring a shift in attitudes both within and across industries. It is best exemplified by Mitsubishi’s commitment to partner with media companies and design new vehicle models that meet specific guidelines because of the increased market demand relating to broadcasting productions. This embodied Minister Lee’s comments about the circular economy, and how tactical steps (in this case monitoring a production’s carbon footprint) can lead to strategic change. Speakers of the third session discussed the potential for balanced and realistic organisational choices regarding sustainability within a production and its team. The panel was chaired by John Maguire, Director of International Relations and Cooperation of France Médias Monde and featured Susan Afan, Managing Director of ABS-CBN’s socio-civic foundation, Dr. Ying-Shih Hsieh, Chairman of Taiwan’s Environmental Quality Protection Foundation, Dr. Masato Kajimoto, an assistant professor at the University of Hong Kong’s Journalism and Media Studies Centre, and May-Yi Lee, Vice President of Regional Production & Development for National Geographic. Ms. Afan led the conversation by explaining how the ABS-CBN Foundation has the ability to request changes to on-screen content. These include placement decisions, which are able to passively influence consumer choices to make them more sustainable. Ms. Lee spoke about National Geographic’s experience with public and employee engagement in social responsibility campaigns, “making environmental conservation films sexier” as well as creating and promoting cutting-edge projects to reduce the environmental impact of watching their channels. One innovative example is ‘Green Definition’, a technology developed by National Geographic’s Latin American team that blacks out roughly every other pixel in any television screen in a way that dims the screen to save energy without compromising visual quality. Not only is this better for tired eyes when watching evening National Geographic programmes, but it can save 54% of a television’s energy, thereby resulting in a lower electricity bill. This revolutionary initiative is just one way in which the 130-year-old company uses its “responsibility to engage everyone in the world to make a difference”. Public education was a key theme that emerged throughout the discussion. As a journalist-turned-lawyer, Dr. Hsieh is now focusing on bringing environmental awareness resources to Taiwanese schools. He emphasised the position that Taiwan is in, excluded from full participation in the UN, but spoke about his organisation’s dedication to engaging with the SDGs and attending UN meetings regardless. This reflects the government’s desire to live up to international standards despite the lack of recognition by foreign powers. Taiwan’s position is akin to that in which the media industry currently finds itself: making editorial decisions that while morally laudable, may have short-term costs for staff in the hopes of a long-term benefit. Making those moral decisions is a difficult task, especially with regard to the phenomenon of fake news. According to Dr. Kajimoto’s research, “fighting that kind of misinformation with the truth doesn’t really work because once it’s politicised the purpose is the politics”. Appealing to emotion is often more likely to sway views than attempting to use logic. To counter the impact of social media-fuelled propaganda, Dr. Kajimoto recommended educating children in news literacy, training them to analyse journalism, and to differentiate between “fact”, “truth”, and “opinion”. This could provide a baseline of knowledge and critical thinking that would elevate the quality of the conversations surrounding urgent issues at a young age. Remarkably, rather than a series of nervous questions and comments from the audience, the discussion was followed by heartfelt responses from educators, who had been inspired by the session and pledged to open a dialogue with their students about news literacy and journalistic activism. In a shift of focus from journalism to sustainability, the next stage of the event was a speech by Taoyuan’s Mayor Cheng Wen-tsan. He spoke about the “highly industrial” nature of Taoyuan and how its industries are “transitioning” by analysing data on sustainability problems like low air quality and responding as urgently to these results as they would to economic factors. It was a poignant reminder that not only can public sentiment affect politicians’ decisions, but political figures can also inspire civilians by encouraging and strengthening voluntary social participation. The final session of the day saw one last panel discussing whether it is “moralising” to engage with sustainability issues in a way that calls viewers and readers to action, and whether this is negative. 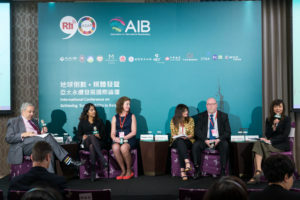 The speakers included: Simon Spanswick, CEO of the Association for International Broadcasting, Lu Ping, Chairperson of RTI, Ms. Tolley, Ms. Worthington, Mr. Maguire, and Anjuli Shere, conference and research analyst for the Association for International Broadcasting. In the opinion of the panel, to commit to “neutral” reporting would be to promote equal but unfair representation and legitimisation of all parties involved in sustainability disputes, regardless of the existing power balances. Ms. Tolley suggested that, in the absence of adequate industry-wide regulatory measures, media organisations benefit from having a charter that states their “overarching purpose”. 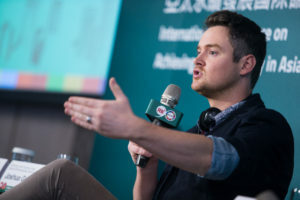 While this would potentially help transparency about biases and sources, Mr. Maguire went further, saying that journalists “need to make a serious effort to call out abuse of power” because to fail to do so would cause irreparable damage to progressive causes, such as the social and environmental issues that the SDGs are designed to address. Ultimately, the media industry – from news channels to children’s programming – should ensure that people have a way of telling their stories in a credible, authentic way that reaches and touches others around the globe, sparking effective change. Throughout ‘Achieving Sustainability in Asia-Pacific’, the speakers and participants have clearly shown that rather than just being compatible with activism, media is itself a form of activism, one that has the potential to make our world significantly more equitable and sustainable.